In addition, the GIGTE is collaborating with the National Autonomous University of Mexico in the fields of linguistics, social anthropology, geology, and natural sciences. The groups recently met in Equatorial Guinea to establish a collaboration agreement aligned with the country’s Horizon 2020 goals. The Committee of Ambassadors from the Africa, Caribbean, and Pacific (ACP) Group of States ratified the Republic of Equatorial Guinea capital of Malabo to become the headquarters of South-South Cooperation. South-South Cooperation is the assembly within the ACP, whose aim is to foster cooperation between the 79 member countries as well as with external partners. The Equatorial Guinea Ambassador to the European Union, Carmelo Nvono-Ncá, presented the proposal, originally announced by the President of the Republic of Equatorial Guinea, Obiang Nguema Mbasogo, earlier this year. The headquarters is expected to begin operations in 2017 with technical and logistical support from the team and world-class facilities in Malabo in order to facilitate high-level political discourse between the member countries. The proposal awaits ratification by the ACP Council of Minister in Belgium later this month. Equatorial Guinea hosted Heads of State and government from the African, Caribbean and Pacific Group of nations (ACP) in 2012, in Malabo for the 7th Summit for African Caribbean and Pacific Heads of State and Government (ACP). The Republic of Equatorial Guinea hosted a successful IV Africa-Arab World Summit at the Sipopo Conference Center in Malabo this past week. The President of the Republic of Equatorial Guinea, HE Obiang Nguema Mbasogo, welcomed world leaders and ministers of foreign affairs, finance, and economy to Equatorial Guinea’s capital to discuss bilateral relations and future investment projects. The outcome of the Economic Forum of the Summit produced the Sheet of Recommendations, which focused on the expansion of regional financial and development institutions to finance private sector investment projects. The Sheet highlighted investment in the infrastructure and transport industry, and called for legislative support to facilitate partnership between the public and private sectors. Stronger partnership is called for to improve the level of services between Arab and African routes, as well as the offering of incentives so traders and carriers renew old fleets and finance new logistics projects. The Sheet also stressed the importance of free international border trade for Arab and African countries and the evaluation of value added services promoted by transport centers. The Summit also featured the presentation of the Al-Sumait Prize for scientific achievement in the field of food security and health on the African continent to leaders in their respective fields. The President presented the Prize to the recipients, along with the $1,000,000 USD award to develop their projects. The next Africa Arab Summit will be held in Riyadh, the capital of the Kingdom of Saudi Arabia. The President of the Republic of Equatorial Guinea, HE Obiang Nguema Mbasogo presented the Al-Sumait Prize for scientific achievement in the fields of food security and health on the African continent. The Prize, named after the late Dr. Abdulrahman Al-Sumait, a Kuwaiti medical doctor, was awarded during the IV Africa-Arab World Summit in Malabo at the Sipopo Conference Center. Professor Kevin Marsh of the University of Oxford and African Academy of Sciences in Kenya won the health category and the Sweetpotato for Nutrition Team at the International Potato Centre in Peru and the International Institute of Tropical Agriculture in Nigeria jointly won the food security category. The education prize will be awarded in the coming months. The Prize of $1,000,000 USD is awarded annually to support the administrative, logistic, and financial burden of the winning individual or organization project. Specific focus areas this year included the development of new varieties of seeds, crops, or livestock to improve food security, the improvement of farmers’ access to agricultural techniques and markets, and the development of farmers’ resilience to climate change, among others. Kuwait established the initiative at the III Africa-Arab Summit in Kuwait in November 2013. Heads of state and dignitaries met 23 November at the Sipopo Conference Center in Malabo for the high-level meetings of the IV Africa-Arab World Summit. 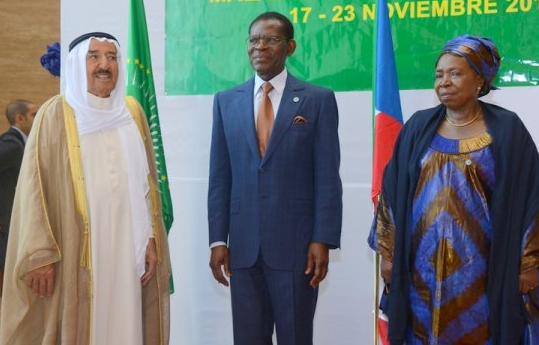 Equatorial Guinea asked Arab countries to share their technical and scientific experience with Africa in order to strengthen the progress and emergence of the continent, said Obiang Nguema Mbasogo, Equatorial Guinea President at the opening ceremony of the IV Africa-Arab World Summit held at the Sipopo Conference Center in the capital city of Malabo. On his opening remarks, president Obiang highlighted the importance of the summit and the need of leaders and businessmen from both regions to cooperate with each other. The Minister for Education and Science of the Republic of Equatorial Guinea, Jesús Engonga Ndong, recently signed a contract to open the American University of Central Africa in the city of Oyala, Equatorial Guinea. The Minister highlighted that the construction portion of the project is now complete and it is set to begin operations. The President of the Republic of Equatorial Guinea, HE Obiang Nguema Mbasogo, initiated the construction of the University, located in Djibloho, in 2006. The Minister also stressed that there are a few details to examine, including the injection of capital for the University, the publication of vacancy for the position of rector, and the outline of statutes. The post of rector requires possession of an international recognized doctorate and at least five years’ experience in the management of large educational centers. Minister of Education and Science, has been working with Stonehill Education, Unicon and the Boston University School of Education to lay the foundations for the American University of Central Africa. The Director of Academic Affairs, Katherine Bernest, and StoneHill Education Guinea, the management company, also attended the meeting. The government of Equatorial Guinea has heavily invested its oil revenues in the country by focusing on improving education, developing human capital and diversifying its economy. Education has been a top priority for the government in Equatorial Guinea. The country has an adult literacy rate of nearly 100%--the highest in Africa. Since 1979, citizens of Equatorial Guinea have received more than 500,000 scholarships to study in universities and professional and technical-training programs outside the country. This figure includes multiple scholarship recipients and people who have remained outside the country. The President of the Republic of Equatorial Guinea, HE Obiang Nguema Mbasogo, reaffirmed the country’s commitment to the Paris Agreement at the COP22 Climate Change Summit in Marrakesh, Morocco. The Summit brought together heads of state from all over the world for high-level talks aimed at the promotion of initiatives against climate change, including the facilitation of renewable energy projects and technology. On the sidelines of the Summit, the President signed a joint communiqué with the President of the Republic of Gabon, HE Ali Bongo Ondimba, regarding the ongoing border dispute between the two countries. The document signaled their commitment to submit the border dispute between the two countries to the International Court of Justice. The Minister of Foreign Affairs and Cooperation of the Republic of Equatorial Guinea, HE Agapito Mba Mokuy, called for close cooperation between Africa and the Gulf countries at the opening of the IV Africa-Arab World Summit Joint Council of Ministers. 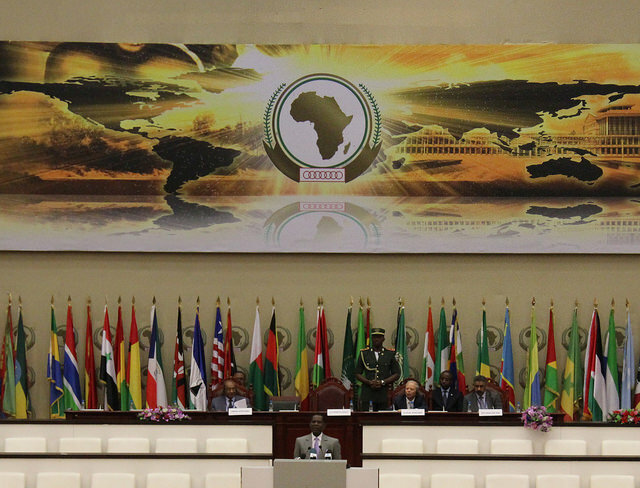 The Summit is being held at the Sipopo Conference Center in Malabo. On his opening remarks, Minister Mba Mokuy highlighted the III Summit in Kuwait, in 2013, as a decisive turning point in the strong relationship between African and Arab nations. He also stressed that the growing threat of terrorism requires global mobilization and close consultations between African and Arab nations. The Joint Council, which included Ministers of Economy, Trade, Finance, and Foreign Affairs, outlined resolutions on the implementation of the Africa-Arab Partnership Strategy, the implementation of the Joint Africa-Arab Action Plan 2014-2016, and the outcome of the resolutions of the III Africa-Arab Summit. The Council also drafted resolution on the coordination for financing future Africa-Arab projects, the implementation of the Joint Action Plan on Agricultural Development and Food Security, and the promotion of the Africa-Arab Cultural Center. A resolution for the drafting of the Joint Africa-Africa Action Plan 2017-2021 was also presented and will be reviewed over the coming days with an emphasis on bilateral as well as regional relations. The Council proposed the V Africa-Arab World Summit be held in Riyadh, the capital of the Kingdom of Saudi Arabia. Africa aims to build a strong and permanent cooperation between the region and the Arab world, said Obiang Nguema Mbasogo, President of the Republic of Equatorial Guinea, today at the economic forum that opened the IV Africa-Arab World Summit. The summit is taking place in Malabo from 17-23 November, 2016. During his opening remarks, Obiang highlighted the cultural and political similarities the regions have and praised the progress and stability of the Gulf countries and how they serve as an example to African countries. Obiang highlighted Equatorial Guinea’s economic development plan aimed at making it an emerging country by 2020. The country has achieved sustainable and diversified economic growth. “This plan not only benefits our country, but the Central African sub region, because it aims to boost the economic and social growth of Central Africa,” he said. The economic forum also featured discussions of the role of transportation and logistics in promoting Africa-Arab trade and investment, strategic cooperation in the maritime transport industry, the establishment of joint investment in railway networks, and the role of financial institutions in supporting projects between the two regions. The Republic of Equatorial Guinea and the Republic of Mali recently signed a framework of economic cooperation agreements, as well as a cultural, scientific, and technical agreement to create a joint cooperation commission between the two nations. The Minister of Foreign Affairs and Cooperation, Agapito Mba Mokuy, worked with his Malian counterpart, Abdoulaye Diouf, to sign three cooperation agreements with the Republic of Mali after several days of meetings between the two nations. Minister of Civil Aviation and Transportation, Fausto Abeso Smoke, and his Malian counterpart, Seinabou Diop, signed an air transport agreement. The agreements are the result of high-level talks between the President of the Republic of Equatorial Guinea, HE Obiang Nguema Mbasogo, and President of the Republic of Mali, SE Ibrahim Boubacar Keita. The two leaders discussed the importance of bilateral cooperation, as well as the prevalence of instability in some African countries. Obiang also congratulated Mali for their efforts to restore peace in their country. The Republic of Equatorial Guinea’s Vice President in charge of National Defense and State Security, Teodoro Nguema Obiang Mangue, recently met with the Ambassador of the People’s Republic of China, Zhao Hongsheng, to discuss the importance of maintaining and strengthening the relationship between Equatorial Guinea and China in order to develop strategic areas such as education, trade, and infrastructure. The Vice President awarded the Chinese diplomat with the Medal of the Order of the Grand Cross of the Independence of Equatorial Guinea for friendship and cooperation between the two countries over the years. The Ambassador thanked the Vice President and President of the Republic, HE Obiang Nguema Mbasogo, for the recognition and highlighted the significant effort and progress Equatorial Guinea has made in public health, human resource development, and trade, among other areas. The Republic of Equatorial Guinea is working tirelessly to ensure a productive and memorable Africa Arab World Summit this month. The Summit will be held at the Sipopo Conference Center, Equatorial Guinea’s world-class center in Malabo, on 17 – 23 November. The President of the Republic, HE Obiang Nguema Mbasogo, has personally toured the center, including the meeting rooms and presidential villas, where heads of state will stay, along with the Minister of Foreign Affairs and Cooperation, Agapito Mba Mokuy. Under the President’s direction, preparations for the Summit have intensified and are sure to show the world Equatorial Guinea’s generous hospitality. The Minister of Industry and Energy, Eugenio Ndong Edu, highlighted the industrial projects that the Government wishes to present during the Economic Forum of the Summit. The President of the Chamber of Commerce, Agriculture, and Forestry of Bioko, Gregorio Boho Camo, has encouraged small and medium enterprises (SMEs) to attend the Business Forum of the Summit and promote Equatorial Guinea’s vibrant commercial sector. The Ministry of Social Affairs is overseeing entertainment preparations. The Permanent Representative of the Republic of Equatorial Guinea to the United Nations, Anatolio Ndong Mba, advocated for unity at the 71st Session of the General Assembly in New York City. In his address, Ambassador Ndong Mba highlighted the equitable representation and number of members as a key issue facing the United Nations. The Ambassador particularly emphasized reform of the Security Council, currently Item 122 on the agenda of the 71st Session. The Ambassador advocated for two permanent seats well as five non-permanent seats on the UN Security Council for African nations. By increasing the number of members, the Ambassador stressed that the United Nations would become a more objective and impartial governing body, taking into account the interests of all the States and geographical regions that make up the broader international community. He highlighted the United Nations as a vital institution for the sustainability of the community of nations and global causes. The Ambassador also expressed support for the Hon. Peter Thompson, as well as the new co-facilitators instrumental in conducting intergovernmental negotiations for the reform of the Security Council.